Yesterday was my last day of classes for the semester! I also turned in a term paper, and the rest of my finals should be completely manageable...which means I'm almost home freeee :) I can't believe that it's already been a year since I've been back home in California. Now I can finally enjoy the weekend and my last days soaking up the holiday season in the city before I go home and see my family and my lovely grandma who is visiting from the Czech Republic this year! On another note, I got a pretty big reminder today on the importance of listening to your body while training. I have been working out pretty hard all week in anticipation of the weekend, and I woke up today sore and tired...yet still made myself go to the gym for a lifting session, ignoring the fact that my back was still a little stiff after maxing out on hang-cleans on Wednesday. Well, I ended up getting a spasm in my back halfway through my workout and can't really sit or walk or bend over without pain. Hopefully it doesn't turn out to be a disc issue, but I have definitely learned another lesson. Have you ever tried pushing through something only to realize that it wasn't worth it? I'd love to hear your stories. Moral of this one: REST and RECOVERY are just as important as a good workout. Happy Friday everyone, and enjoy the recipe! Cut cabbage in half, set face down on a cutting board, and finely chop into thin "shreds." Heat olive oil over medium heat in a large pot, add cabbage, and cover. Stir occasionally and cook until cabbage softens, about half an hour or so. If the cabbage starts sticking to the bottom of the pot, feel free to add water as needed. If using a crockpot, throw in cabbage, turn on low or high setting, and let cook until steamed and softened. This may take 1-2 hours. 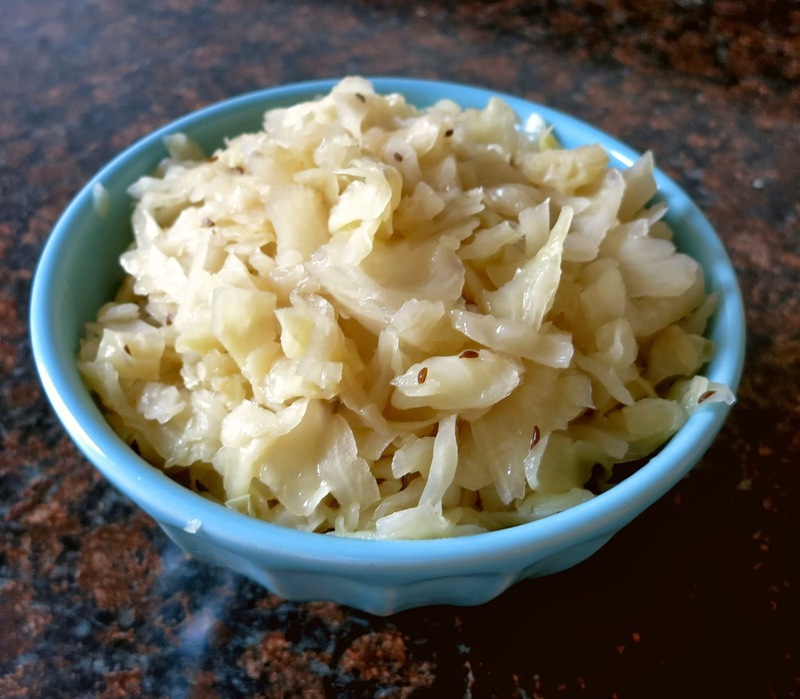 When cabbage is steamed, add vinegar, caraway seeds, salt, and sugar, stir well, and cover. Let steam for another 5-10 minutes. Serve hot or cold, and enjoy! This is seriously one of my favorite side dishes. Side note: the flavors mesh even better after about a day in the fridge...try it out! I did the exact same thing on the same day! Went too heavy on deadlifts and tweaked my back. It's a hard balance to find - pushing yourself, but not injuring. Exactly! It's a bummer and a slow process getting back post-injury...hope you are healing well!